Basement of Ghoulish Decadence: Check out this new interview with yours truly over at HORROR SHOX! Check out this new interview with yours truly over at HORROR SHOX! 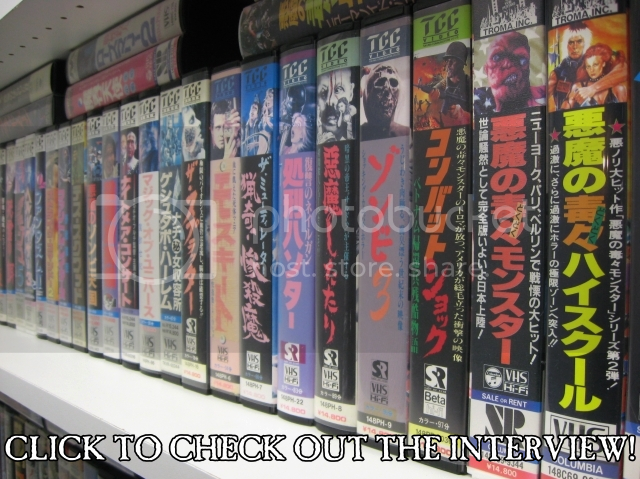 I was just interviewed regarding my love for Japanese VHS by the operator of the Japan-based horror news/review blog, ホラーSHOX [呪] (Horror SHOX)! It's funny how connections like this are made. I actually bookmarked his blog long ago and visited regularly because of how cool it was to see an overseas horror blog so thoroughly devoted to keeping up on the global scene. Then after finally joining Twitter a few months ago (@ghoulbasement), I began following several extremely friendly Japanese bloggers which eventually lead to finding tinker of Horror SHOX (@horrorshox). After seeing how passionate I am about collecting his native country's videos through his followers, he requested this little interview to which I was happy to oblige. He seemed shocked that Japanese VHS had acquired a collector market out of the country so that naturally led to questions. Thankfully along with also being very gracious he's quite fluent in English, so you'll find the questions and answers to be bilingual. 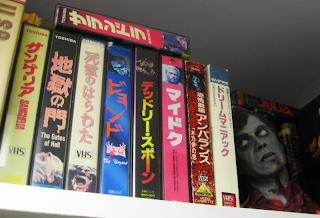 The rest in Japanese is basically his surprise in discovering such an interest in VHS, especially outside of Japan, and how he initially found out about me along with a few other U.S. collectors like Lunchmeat VHS and Video Vendetta. My Japanese VHS wishlist is also included with translated titles (if you any, please contact me!). And finally I'd like to personally thank tinker for the opportunity of the interview. 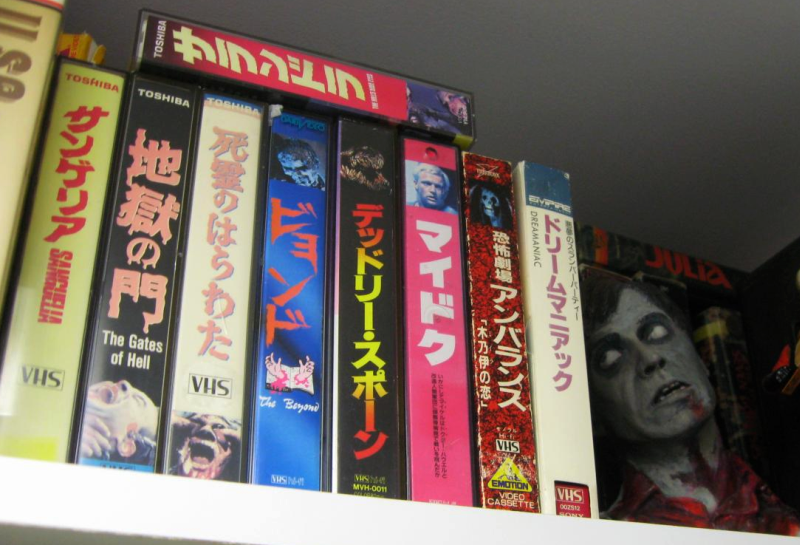 Your love for the genre, along with many other horror fans in Japan, shines through and it's great to see that (and of course VHS!) can so easily cross borders and even cultural boundaries! Long live (Japanese) VHS! Thank you so mcuh! It was fun to create the article for me. I'm glad you enjoy it. The most intersting part was your answer regarding Japanese bootleg tapes (Scott Spiegel's "Intruder") because I didn't know at all that Japanese version VHS in 80s had been so special things. I didn't know the fact that they had been heavily censored in other countries. I just believed I was watching very normal stuff, director-intended ones. Actually, I had no idea what censorship is when I was watching VHS in 80s lol. Maybe I was so simple-minded at that time. I assume a lot of Japanese people who read the interview share the same surprise as well as I felt. It is always fun to get to know each other beyond the boundaries, borders, whatever, and yes, we can cross them very easily! Happy hunting VHS!